Today’s gospel reading relates the feeding of the five thousand as told by Matthew (14:13-21). This episode in Jesus’ ministry is one of the rare ones that appears in all four gospels (Mk 6:32–44; Lk 9:10–17; Jn 6:1–13). 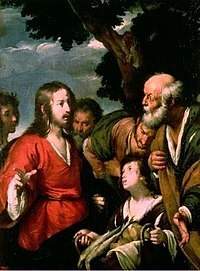 The story is a familiar one: multitudes come to listen to Jesus and, after a long day, as opposed to the suggestion of some disciples that the crowd should be dismissed to get food, Jesus wants His closest companions to feed the group; with only a few loaves and fish, Jesus blesses the food and then feeds the entire gathering of thousands. As the headline says, all consumed their fill. Not so much directly here, but certainly in John’s account, considering how it leads into the Bread of Life discourse (John 6), the tie-in between this episode and the Eucharist is clear. The heading to this post struck me today in a particular way in this vein. When we partake of Holy Communion do we feel satisfied? We should. An infinite amount of grace is available in each Host. The more we are open to this grace the better we will be satisfied. If our “appetite” is “spoiled” by sin, vice, bad habits, worldly concerns, “junk food” if you will, how can we approach true and total satisfaction in the Bread of Life? Our consumer culture has us imbibing a lot of unhealthy influences. Turning off, simplifying, and praying are good ways to scrape off the dross of our lives and be open to God’s gifts. Frequent recourse to Confession is an excellent way to “clean house” and receive the strength to overcome those sinful ways that are barriers to fulfillment. May all Catholics, and all the world for that matter, come to find true contentment in the Eucharistic Lord!